Pioneers in the industry, we offer thermocouple compensating cables from India. 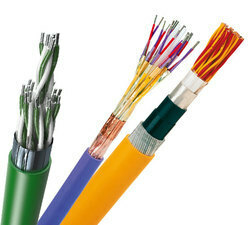 Our Standard line of thermocouple wire and cable is available in a wide range of insulating and jacketing materials like fiberglass yarn, Asbestos Yarn, silica yarn, Alumina-Silica Yarn, Nextel Yarn, Stainless Steel Wire Braiding to suit the most demanding environmental conditions. Chart No. 2 gives the most popular combinations of material and the characteristics of each. Special situations may require other types of materials. INSUCON'S technical service team is available to help in determining the exact choice for your application. The key to precise temperature measurement is consistency. Establishing very exacting standards of calibration, ANSI, the American National Standards Institute and ISA, Instrument Society of America have been able to govern the specification and manufacture of thermocouple and extension wire and cable . These standards establish quality control techniques and require certification by the manufacturer to ensure performance. Looking for Thermocouple Compensating Wires and Cables Omega Type ?